The Huayang Site is situated 1,500 meter northwest to the Huayang Operation of Nancha District, Yichun City in Heilongjiang Province. The site lies on the secondary terrace on the left bank of the Tangwanghe river, the first branch of Songhuajiang. This site raises ca. 20 meter higher than the level of river, with 180 meter elevation. Due to a series of archaeological investigation conducted in 2011, the Heilongjiang Provincial Cultural Relics and Archaeology Institute found the site and took protective action. The Huayang Site could be divided into eight stratifications. The first layer is topsoil, including a smaller quantity of yellowish-brown coarse sandy ceramics fragments. The second layer is hard, dark brown sandy clay with few coarse sands. On the bottom of this layer connected with the lower one, there has been a large quantity of carnelian artifacts, ceramics fragments with attached pattern and two house foundations. The third layer contained light yellowish-brown sandy clay with a larger quantity of coarse sands. The bottom of this layer included a great number of flint artifacts and smaller quantity of quartz artifacts. The forth layer contained mass of pure and black clay, filling some pits of a lower level, where there has been found a great number of quartz artifacts. The fifth one was yellow sandy clay coarse sands, in which the number of coarse sand gradually increases from the top to the bottom. The upper parts are loose, while the lower parts gradually hard containing a great number of flint artifacts. The sixth layer is bluish-yellow clay with few coarse sand, and contained many stones and fine flint artifacts. The seventh one is pebble layer, with a smaller quantity of stone artifacts in its upper parts. The eighth layer is powdery deposit of bed-rock, lack of cultural remains. Beneath the eighth layer was the bedrock. The 2-7 stratum of the Huayang Site may have been dated to the Paleolithic Age, including the remains of early, middle and late periods. 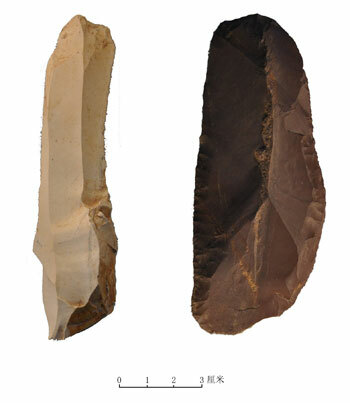 The early period consisted of the remains of fifth to seventh layers, characteristic of large stone blade-tools and blade-blank tools made by light yellow & red flint. 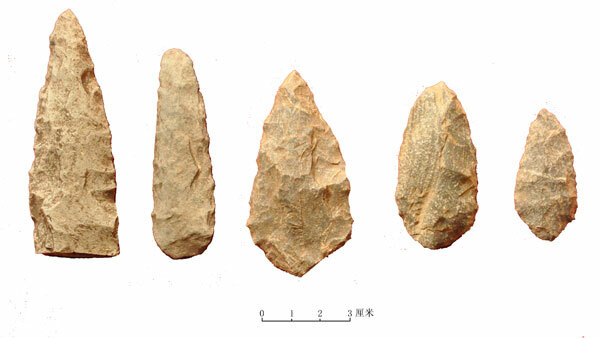 The middle period containing the remains of the third and fourth layers is characterized of blade product by yellowish-green flint, two-sided pointed artifact by dark grey quartz and stone chisel with its edge grinded. The late phase is consisted of the second layer and two houses foundation opened beneath this level. Most of the remains during the late period were carnelian artifacts, as well as microblade products, fully pressed stone arrowheads, grinded stones, and cylindrical sandy pottery jars with attached patterns. Two semi-subterranean houses with square outline and round corners was found, remaining wall foundation on their four sides, partly filled with stones. House F1 has an area of fifteen square meters, and F2 twenty-eight square meters. With the evidence of stratigraphic condition and feature of artifacts, it is suggested that the Huayang Site is consisted of three phases of remains (early, middle, and late) spanning the late of Paleolithic, transition from the Paleolithic to Neolithic, Neolithic Ages. It also indicated the route of technological development from large through small stone blade, two-sided pointed items, and partial grinding, to microblade, pressing and fully grinding techniques.